Burglars have made off with a number of trophies from the home of former champion jockey Frankie Dettori. The raid took place at the jockey's home in Stetchworth in Cambridgeshire on Friday evening. Dettori's agent, Peter Burrell, said his client had been left "deflated and sickened" by the burglary. Dettori won two races at nearby Newmarket on Saturday and said after the race the main thing missing was his MBE medal - awarded in 2000. He has also lost three Gold Cups that he won in Japan. "I discovered the burglary when I got back from Salisbury last night and I am amazed they didn't take any more trophies," he said. Cambridgeshire police said jewellery belonging to his wife Catherine was also taken in the raid. 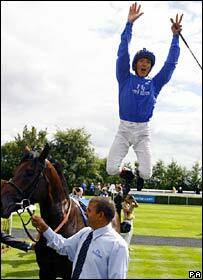 Dettori rode every winner on a seven-race card at Ascot in 1996. "The items that were taken during this burglary are easily recognisable and would be easily identifiable," said a police spokeswoman. The Italian-born jockey, famed for leaping off his horses after a victory, has won the jockey's championship twice. On 28 September 1996 he hit the headlines by riding every winner on a seven-race card at Ascot. His "Magnificent Seven" cleaned out the bookies, and even halted BBC Grandstand's Final Score as the cameras showed live coverage of his success. Up until recently he was a team captain on the BBC quiz A Question Of Sport.